I really wanted to try a Mennonite restaurant while I was in Saskatchewan as there is a large population in the province. 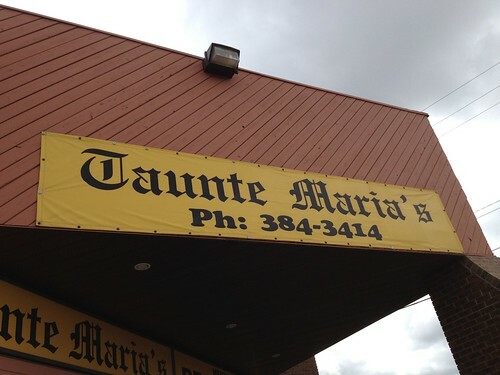 I was lucky enough to get a chance to have lunch at Taunte Maria's, only open for breakfast and lunch. With a large menu and so many things to try, I felt a bit overwhelmed. 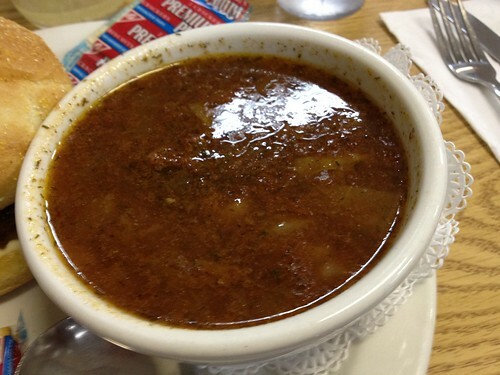 I decided to start with the kommst borsch ($3.95). Unlike the more commonly known Polish borsht, which is a beet soup, Mennonite borsch is a cabbage soup, whose origin come from the Mennonites in Ukraine and Russia. I enjoyed the simple cabbage soup. There was also a summa borsch with potatoes, onion, dill and sausage that I would try next time. 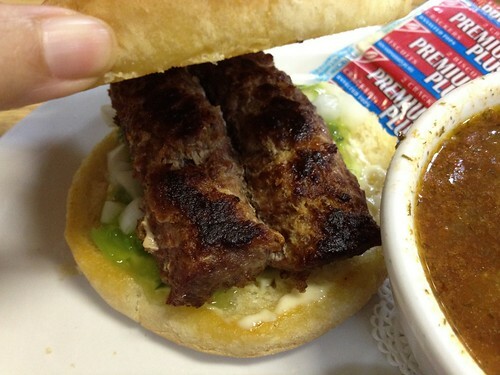 The reason I did not order the somma borsch was that I also ordered the Unkel Yakob ($5.95), a farmer sausage on a bun with relish, onion and zesty dressing. It was not what I expected at all. The sausage was clearly homemade and made a nice accompaniment to my soup. While in Saskatoon, I really wanted to try Saskatoon berries. Unfortunately, I was unable to find any. I even inquired at this restaurant for Saskatoon berry pie. No luck, but was convinced to try the strawberry crisp with ice cream. Yums! All the food at Taunte Maria's Mennonite Restaurant is simple homemade food, just the way I like it. The prices were good and the staff very friendly. I hope I get a chance to visit again and discover other Mennonite dishes. While working in Saskatoon, I stayed near the Saskatoon office near the airport. One evening, I ventured out to downtown Saskatoon to walk along the South Saskatchewan River, look at art for free at the Mendel Art Gallery, and have a nice meal all by my lonesome. I don't travel very often for work, and usually just pick up some food, or eat at the hotel when I'm on my own. I thought I would go out of my comfort zone and experience eating a nice meal on my own. 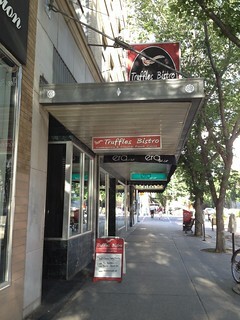 Truffles Bistro specializes in French fare. I decided on this restaurant for dinner because it is known for sourcing its food locally. It is located in the historic Birks building, and boasted very high ceilings and an open kitchen in the back. Complimentary chips and aioli first came to the table. While I apprciated the freshly fried chips, I think they were slightly overdone, giving them a slightly burnt taste. First time ever that I did not finish chips placed in front of me! 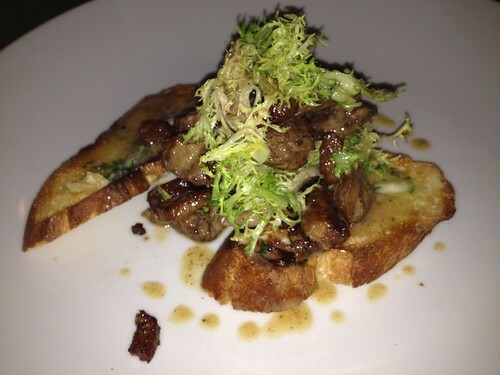 For my starter, I ordered the pan seared local chicken livers ($12). I really enjoy chicken livers and so if I see it on the menu, which is rare, I will likely order it. The server seemed to approve of my choice, and understandably so. The livers, cooked with lardons, were served on two slices of toasted baguette, topped with greens and a Dijon vinaigrette. The acidic vinaigrette worked very well against the fatty lardons and creamy chicken livers. I was very happy with my dish. Pan seared local chicken livers. 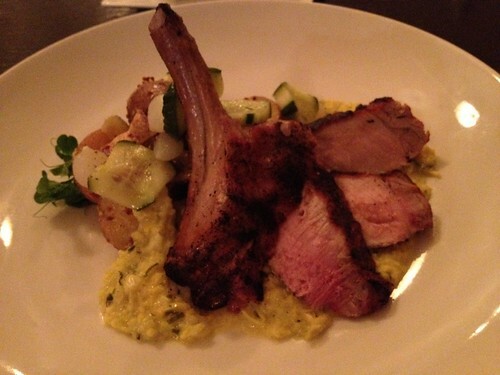 For my main, I ordered the grilled Saskatchewan pork loin chop. The perfectly cooked chop was served on top of a creamy corn tarragon purée, with a side of Dijon potato salad. The chop was also well seasoned with a dry rub. The potato salad was studded with bacon and good but I slightly wished it wasn't a cold salad. 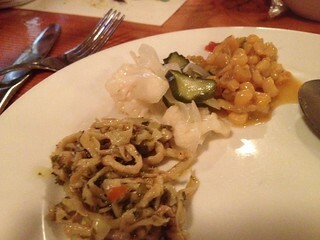 One of my favourite components of the dish were the pickled cucumber slices and onion. I recently discovered that I am a sucker for freshly made pickles! Grilled Saskatchewan pork loin chop. 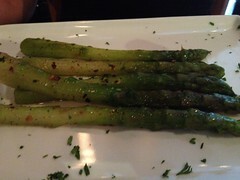 I was very happy with meal at Truffles Bistro. I think I picked well. 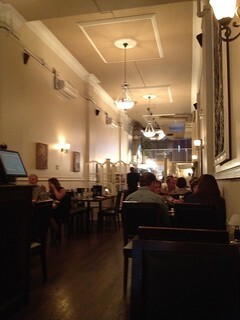 The staff at Truffles Bistro were very nice and friendly, maybe even slightly more attentive because I was on my own. Unfortunately, I think I felt a bit awkward and acted like a skittish cat. I realize there was no reason to feel this way, and hopefully, I will feel more comfortable dining on my own once I have a few solo dinners under my belt. I spent a week in Saskatoon for work in July, and so had a chance to try some local food. 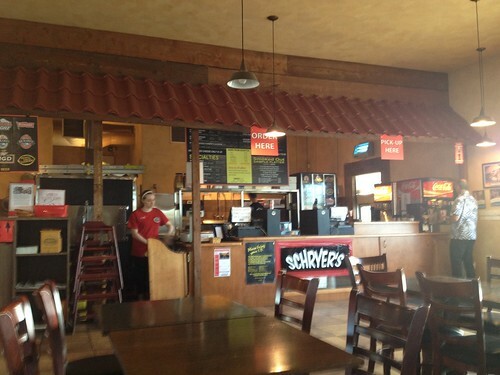 Near the office was Schryer's Smoked BBQ shack, which allowed me to have some BBQ for lunch. 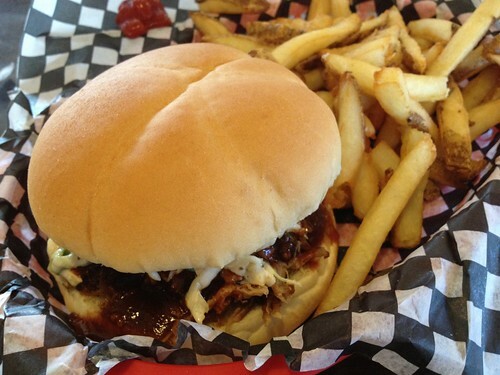 I ordered the hickory smoked pulled pork sandwich combo ($8.95), which came with fries and a fountain soda drink. The pulled pork was topped with homemade BBQ sauce, that was not overly sweet - often a problem when it comes to pulled pork. I had my sandwich also topped with coleslaw. It was a delicious BBQ mess to eat. If I ever have to come back to Saskatoon, I know where I'll be stopping for lunch. They also offer chicken and ribs, but I may have to stick to the tried and tested pulled pork. After a hard workout of kayaking in Huntingdon with Kayak Safari, Elle, E (who started her own sweets blog) and I went searching for food. 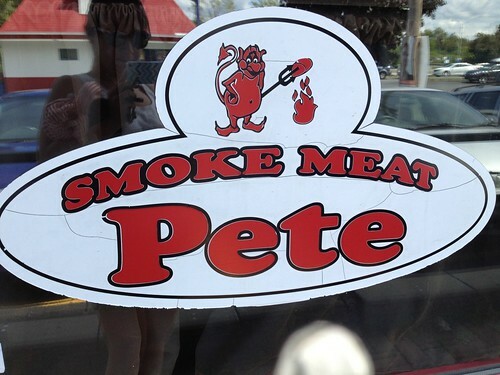 Elle suggested Smoke Meat Pete which was on the way back to the city. 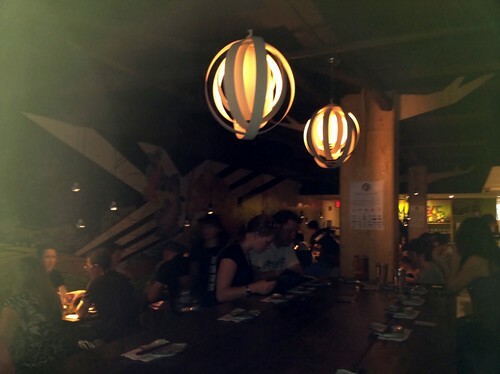 Smoke Meat Pete has had the title of best fries in Montréal and we wanted to check it out. It did give me a chuckle to see the newspaper clipping from years ago. Elle and I shared an order of smoke meat sandwich, fries and coleslaw. Honestly, I don't have any comments to how this smoke meat differentiates itself from other Montréal smoke meat, specifically Schwartz's Deli. 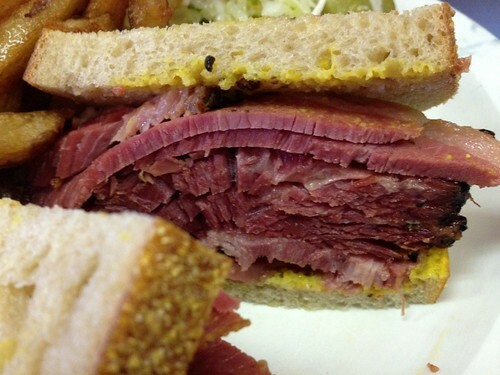 I remember the smoked meat being satisfying and that's all I wanted. Same thing with the fries. Would I say they're the best in the city? Probably not. Did they hit the right spot? Sure did. There are two main categories of fries (that I can think of right now anyway): the super thin and crispy fries, and the fatter fries that are soft in the middle. These were definitely excellent ones from the latter group. 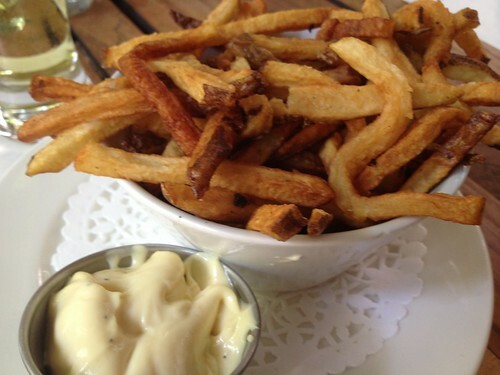 I remember buying the same type of fries for $1, served in a paper bag, by Côte-Vertu métro that were just as satisfying. 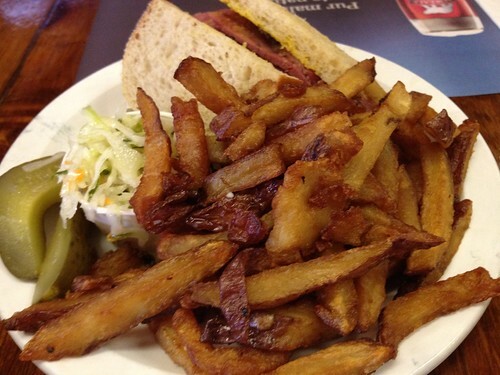 Would I recommend driving all the way to Ile-Perrot for smoke meat and fries? No. Would I recommend stopping by if you're in the neighbourhood? Definitely. 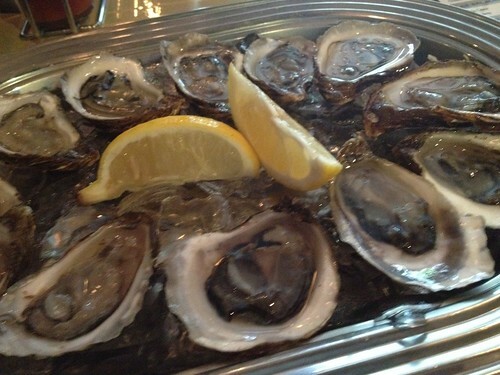 My friend Cee is obsessed with oysters and asked me if I wanted to check out Maestro SVP to have their oyster special: a dozen Beausoleil oysters from New-Brunswick for 16$. I'm no oyster expert but the small oysters, accompanied with lemons and a mignonette, were briny and tasted of the sea, just as they should be. 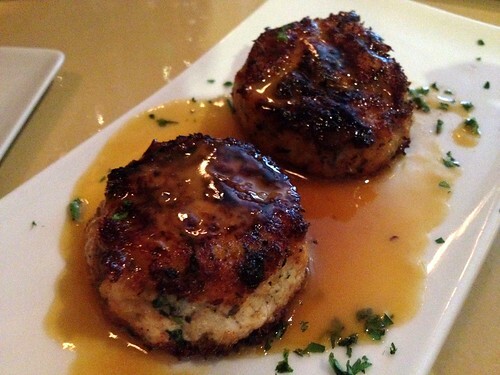 Crab cakes, bruschetta & asparagus. 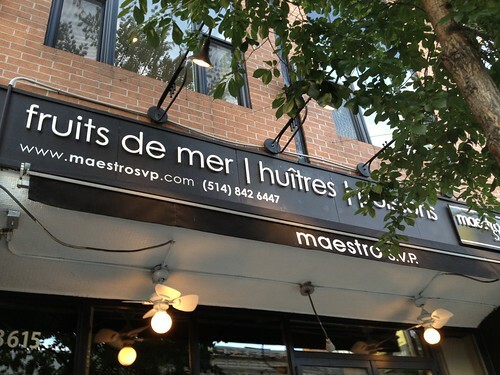 Maestro SVP offers the best oyster deal in Montréal. So if you're an oyster lover, go check it out. Otherwise, the dishes that I ordered were rather on the small size for the corresponding price. 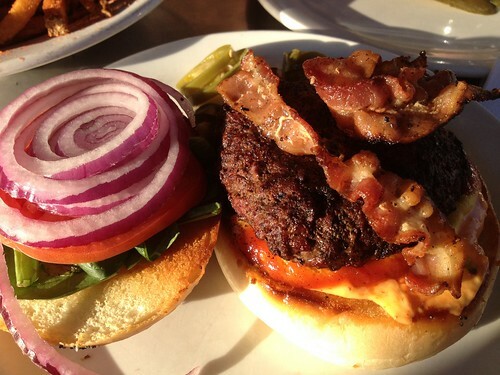 Once in a while, either I or Elle will get a burger craving. Not sure whose craving it was that brought us to Burger de Ville, but there we were one summer evening. Elle had already been to their Saint Laurent Boulevard location, but it was my first time at this burger joint. I ordered the bacon burger ($5.50) and asked for some harissa mayo on the side for our order of spicy fries. They added the mayo into the burger instead. There is a generous list of free toppings, including caramelized onions and sauteed mushrooms. 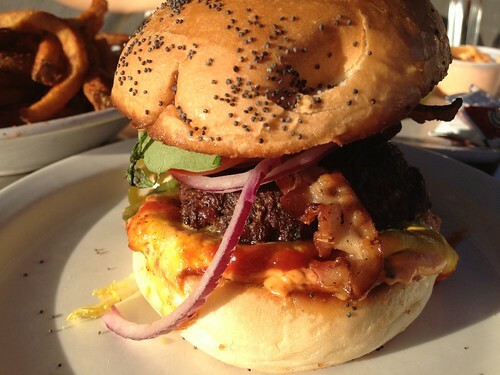 One can make quite a burger with the free toppings offered. The fresh burger patty - "Always fresh, never frozen" being the motto - is sandwiched between nicely grilled poppy seed buns. Elle ordered the Saint-Paulin burger ($7.00) for the added cheese. Otherwise there are not too many other burger options as you can build your own but there is a vegetarian option that sounds tasty with grilled vegetables and goat cheese. 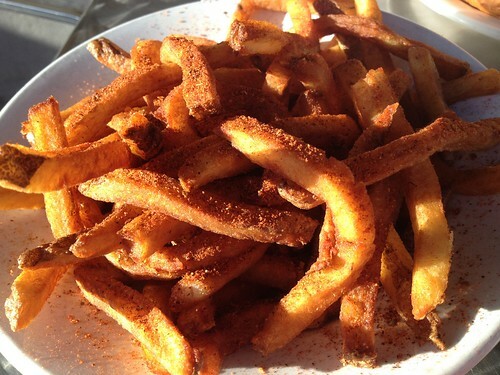 Since there is no combo, we shared a plate of spicy fries ($3.00) that was plentiful for even more than two people. The spiciness came from the seasoning; the spicy fries were great dipped in the harissa mayo. 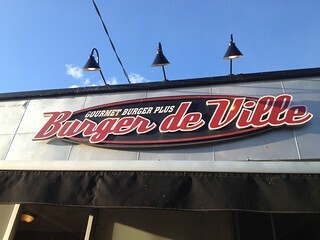 Burger de Ville offers fresh burgers at a great price point.Why go to fast food joints for burgers when such options exist in Montréal? This summer, I met up with my friend Cee and others for lunch. 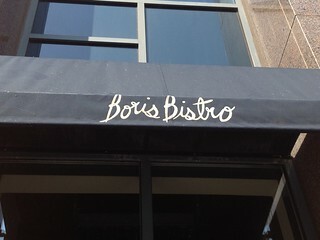 She picked Boris Bistro while searching for a restaurant with a great outdoor space. 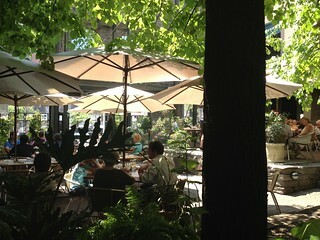 Boris Bistro's outdoor setting cannot be beat. Shaded tables in a not very small nook make it a perfect space for an outdoor lunch in Montréal, well reputed for its terrasses. 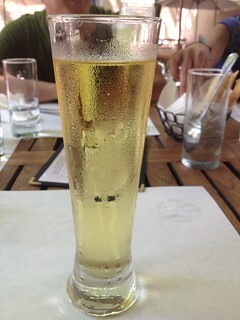 I started out with a refreshing sparkling apple drink. I drank it very quickly as it was hot. I decided to order two starters as I like variety. 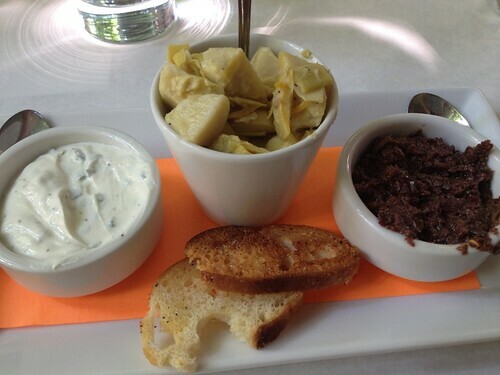 I had a trio of tapenade that included an olive tapenade, an artichoke mixture and a cheesy dip. All this accompanied by two very small, very thinly sliced toasts. It was rather disappointing as the tapenade was salty and needed more bread. 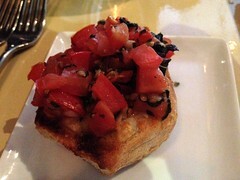 The other two components were good, but it was slightly deceitful to call them tapenade. This is no longer on the menu, replaced by a wild mushroom toast that sounds potentially better. I decided to indulge and order the potatoes fried in duck fat. The fries were very good but I'm not sure I noticed that they were better than any other fries, i.e. not sure I noticed the duck fat. 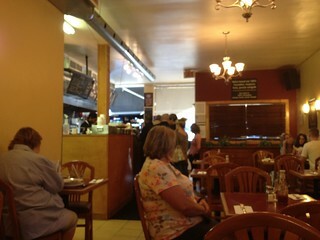 You can't beat the location at Boris Bistro. I may not have ordered well, and admittedly did not order a main. The food I did order was good, but not extraordinary, and on the pricey side for the portions porvided. You're paying for where you are sitting so enjoy the setting and bask in the sun. My first outing at Imadake was a few months ago, after my friend Cee's return from Australia, for dinner dinner and catching up. I wanted to go to Kazu but they were closed for a few weeks for vacation. I guess even cooks have to take a break! After surfing different sites, and at Elle's recommendation we headed out to Imadake for an early Saturday evening dinner. The restaurant was not too busy when we arrived but according to the waitress many of the tables were reserved. After staring at her table set up map, she sat us at a very large and long table, as long as we were out by 8 pm. 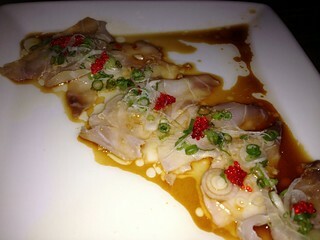 To start with, Cee and I shared the beef tataki with ponzu sauce and white fish carpaccio (which I no longer see on the menu). The beef was just slightly seared and sliced thinly. The white fish was topped with a bit of roe. Both made for great light starters. 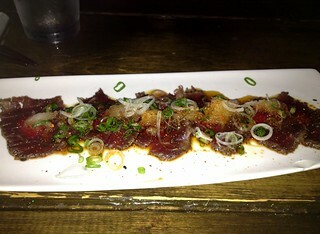 Beef tataki and white fish carpaccio. After reading about the black fish cod on La Bouche Pleine, we each had to order our own portion. 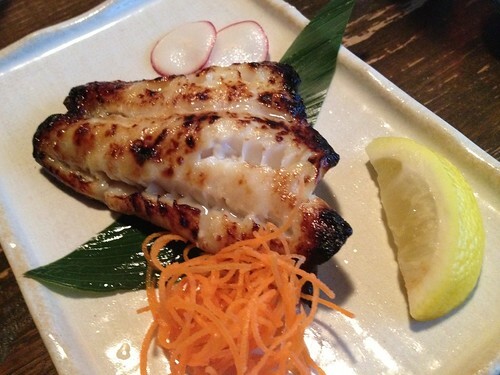 Just as it was described, the fish was perfectly cooked and flaked in pieces that melted in your mouth. I loved the miso on the fish and the caramelized skin. 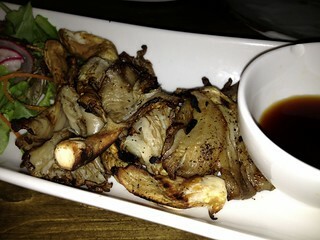 To accompany my cod, I ordered some grilled mushrooms which were mainly oyster mushrooms. Cee ordered a salad, which was accompanied by a decadent peanut dressing. 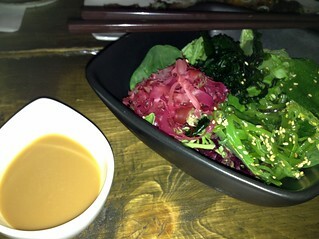 When my friend Tee came into town, I took her to Imadake for dinner (while her hubby stayed home with the kids). We ordered a few small plates to share, including the the black cod obviously. 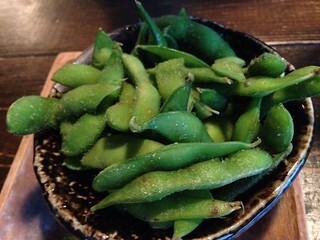 The edamame ($3) was a nice salty snack. 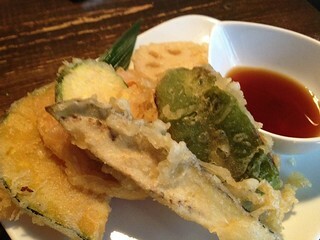 The vegetable tempura ($6) was well fried and crispy. I wish the pieces were smaller as they were not well sized for sharing. 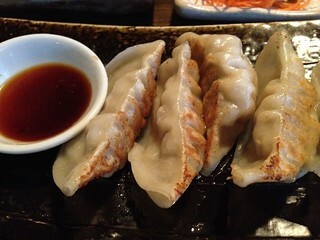 The pork gyoza were fried but still juicy on the inside. 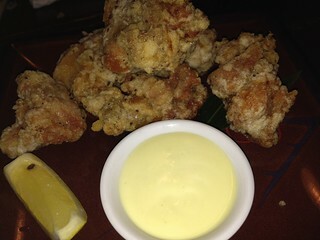 Finally, the karaage - fried chicken ($8) were nicely crispy, served with a wasabi mayo. I really liked the chicken but would have preferred less fatty pieces of chicken. I had to pull out some pieces of fat. 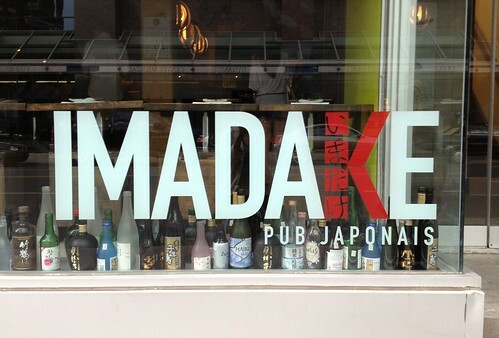 Imadake is a fun place to eat. 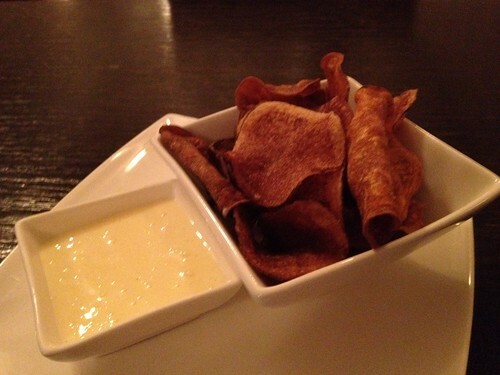 Their menu of small plates is conducive to trying different dishes. It was busy both times I visited. Don't be startled by chants from the tiny Japanese waitresses of "when I say sake, you say BOMB, Sake BOMB, sake BOMB". While there is a huge backlog of food posts (short trip to Saskatchewan, long trip to Hawaii, and regular eating in Montréal), I am breaking the chronological order of posts to write about our recent visit to Cabane à sucre Au Pied de Cochon for their autumnal apple menu 'Tombe dans les pommes'. I thought a timely post was in order as the PDC site advertises there are tables available on Thursdays at 5:30 PM and 6 PM. So if you're interested, reserve RIGHT NOW! Cabane à Sucre Au Pied De Cochon. After reading about the first edition of Cabane aux Pommes on Shut up and eat, Elle was able to snag us a table on a Friday evening (we were also lucky enough to enjoy the sugar shack meal earlier in the year). Joining us for the fall feast were her hubbie D and our friend MJ. Pumpkin patch in front of the Cabane. Our group of four was seated with a group of 5, who seemed to already have demolished a jar of cornichons at the table. If we weren't so last minute, it would be really fun to organize a group of 10 to go to the cabane, and slightly less awkward. To start out with, the girls ordered the specialty apple drinks while D preferred his beer. MJ and Elle ordered the apple slush made up of crushed ice, apple juice and spiced rum. They loved their sweetly spiced drink. I ordered the apple martini and it was way too strong for a lightweight like me. The first set of dishes meant as starters quickly came out: la tête fromagée, squash soup and sheep yogurt. The now infamous tête fromagée was topped with head cheese and underneath it were two charcuterie maison, made with locally sourced pork: jambon vieilli similar to prosciutto and a bacon like one from the pork belly. The charcuterie was even better accompanyied by the apple mustard, the replenished cornichons, the homemade pickled eggplans and corn relish. I have a complete obsession with homemade pickles now! One of our favourites of the night was the squash soup gratin with Gruyère and Emmenthal cheese, apple slices and topped with amaretti cookies. 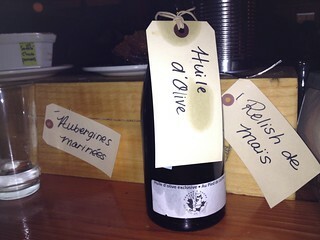 We were encouraged to add olive oil to our own bowls. The savouriness from the cheeses, the sweetness from the squash and the unexpected crunch from the amaretti worked so, so well together we couldn't get enough. I had a tiny second helping, even though I knew I would pay for it later. Lastly came the caillé de brebis avec miel en rayon, brunoise de pommes, copeaux de terrine de foie gras et salade de pousses - a sheep's yogurt with apple brunoise, flaked foie gras terrine topped with a honeycomb. It paired well with the freshly made bread. Every one at the table was in love with the bread, airy on the inside and crusty on the outside. The bread also made for a perfect vehicle for the homemade apple butter. As our group was small, we didn't get the show that is the pasta dish made in a large Parmesan wheel but we witnessed it numerous times at other neighbouring tables (including, I'm 85% sure, an old organic chemistry professor, Dr. Lysy?). The pasta, consisting of cavatelli and raviolis au foie de volailles liquide (liquified poultry liver), are added to the wheel, Parmesan cheese is grated in as seen below, sous vide foie gras is added to the pasta and mixed into the sauce.The pasta is then served in the omnipresent multicoloured Le Creuset pots. Pasta tossed in a Parmesan wheel. The liver ravioli was meant to be eaten in one bite, with the molten liver exploding in your mouth, reminiscent of the foie gras cromesquis served at the restaurant Au Pied de Cochon. The sauce was sweetened with apple sauce and flavoured with rosemary. I made the mistake of going for a second ravioli, when one really was enough. Cavatelli and liver ravioli, topped with foie gras. The first main dish consisted of PDC's version of surf and turf. The surf consisted of warmed Malpeque oysters from PEI and the turf a beef shoulder with carrots, cepes mushrooms (we only found one!) and caramelized onions braised in white wine. The beef was fall of the bone tender. The salmon en papillote was stuffed with apples, basil, onion, garlic and lemon. The accompanying sauce was made up of braised endives, buccin (sea snails), clams, bacon, potatoes, cider and cream, and was very reminiscent of a clam chowder. Boston lettuce leaves were served on the side, to make lettuce wrapped beef or salmon rolls, at the diner's desire. The final main, but definitely not the least, were eggplant pancakes with broccoli and hazelnut paste. The chef recommended topping an oyster with caramelized onions on the pancake. We unanimously loved this dish. It was very creative and unique, and the broccoli with hazelnut paste, similar to a peanut sauce, was completely addictive. Eggplant pancakes with hazelnut broccoli. As we were taking respite from food before dessert, the chef himself Martin Picard started to work the room. He talked to the diners at the bar first, and then went from table to table to say hello. He even graciously took individual pictures with the people from the table behind us, which might have gotten an eyeroll from me. PEOPLE: if the chef is nice enough to take pictures with you, just take one or two and let him move on! We mentioned to him that we saw him riding his tractor and he replied that's when he's at his most relaxed. I also showed him I was wearing sweatshorts (that Elle nicely cropped off) to comfortably stuff myself and he said that was a very good strategy! With none other than Martin Picard. Finally, when we didn't think we could eat much more, it was dessert time. Apple pie was served with marbled ice cream, consisting of apple sorbet and vanilla honey ice cream. A sticky toffee pudding, with a base of plums and apples, was cooked in and served from a can (like the duck in a can!). The pudding was then drizzled with a homemade caramel sauce. 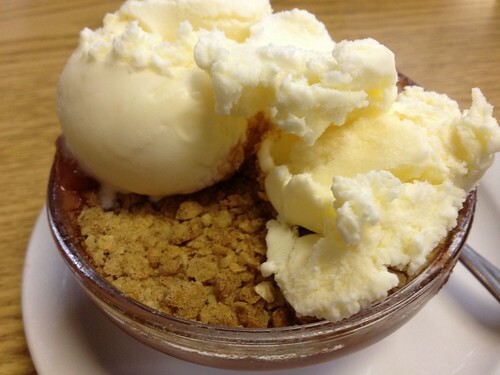 Apple pie, ice cream and toffee pudding. The final dessert and final dish of the night, were soufflés with caramelized apples and chocolate ganache at the bottom. I could barely eat, so honestly only had a few bites but it was delicious. The soufflé itself was light and airy, and all that one would want from a soufflé. 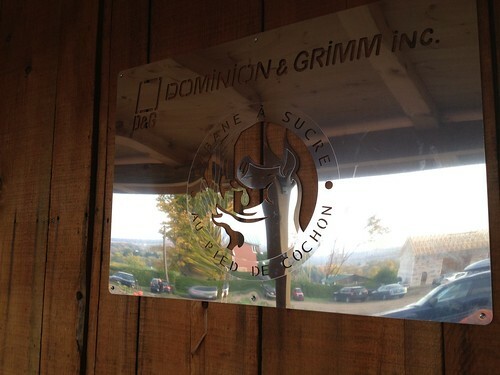 Everyone enjoyed our meal at the first Cabane aux Pommes and thought the $50 was well worth it. From our experience with Cabane à Sucre, we brought our own Tupperware to bring leftover food home. Having gone to both, Elle and I agreed that if we had to choose, we preferred the fall edition of the cabane. For this year anyway. For me, I think I liked the addition of produce (the pickles, the squash soup and broccoli). For a locally focused menu, it makes sense that there is more produce on hand in the fall compared to the winter. I have a feeling that Chef Martin would rock a vegetarian meal. Maybe when hell freezes over. Elle liked the more simple menu compared to the over-the-top items in the winter.